Laminate flooring is known for its hard-wearing aspects, its durability and the sheer number of patterns that can be chosen. Still, the installation process can be slightly tricky when referring to larger environments. 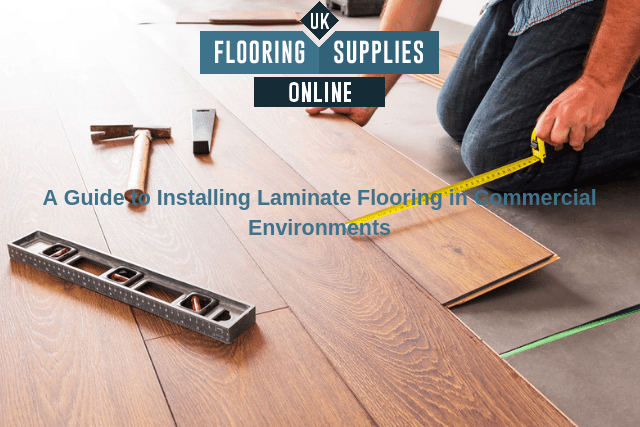 Let us look at some basic guidelines to follow if you hope to efficiently and correctly install commercial laminate flooring. Checking the condition of the sub-floor. Accurately measuring the dimensions of the environment. Installation an underlayment (if one is not already present). Allowing the sub-floor to dry for at least 48 hours to remove any existing moisture. In the same respect, be sure to purchase the correct vinyl flooring adhesives so that the laminate remains in place after installation. Please note that commercial laminates are slightly different when compared to domestic versions. They are often thicker and their surfaces are intended to stand up to a significant amount of wear and tear over time. If you are uncertain which type is required, it is best to consult directly with the provider in question. This can avoid a potentially costly mistake from being made. During the installation, be sure to leave a gap of approximately three centimetres around the periphery of the room. This is known as an “expansion gap” and it will help to accommodate for changes in the size of the completed floor once the laminate adhesive has dried. If you are dealing with an extremely large area (such as a showroom or a cafeteria) it may be better to increase this gap to five or six centimetres. We should also look at some common errors before concluding. For instance, do not install commercial laminate on uneven surfaces or if there is a drain in the floor. Laminate cannot be installed directly over carpet and never place more than a single underlayment beneath the laminate; this might impact the integrity of the joints over time. Keep in mind that this is only a very basic guide. If you would like further advice or to appreciate the flooring options at your disposal, it is wise to contact UK Flooring Supplies Online for additional details.